Food truck alert! Healthylicious has joined the vendor lineup at the Memphis Botanic Garden farmers market, serving cold drinks and fresh food smoothies with a Mexican twist. 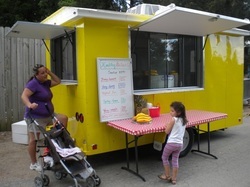 Food trucker Karen Febles, whose sunny personality is as cheerful as her yellow truck, is making aguas frescas with fruit and vegetables from the 30 acres she and her husband farm in Ripley. “I use kale and berries from the farm and, of course, we will have lots of watermelons,” Febles said, whipping up a cold and frothy “Tropical Fun” smoothie, one of her most popular drinks combining mango, pineapple, orange and strawberries. Febles started juicing after a miscarriage, combining her fresh food focus with healthy ingredients indigenous to her home in Merida, Mexico, located about four hours from Cancun. For instance, Jamaica is an iced herbal tea made with hibiscus flowers, which are a natural diuretic. “Think of Jamaica as ice tea from McAlister’s, but with hibiscus and raw sugar instead of tea,” Febles said. Her menu changes with new products and her own inventiveness. "I just found three beautiful dragon fruits," she said. "So I'm making lemonade with them for Saturday." In addition to the Wednesday market in East Memphis, Febles is bringing the Healthylicious truck to the downtown farmers market on Saturday and to the Agricenter farmers market on Monday, Tuesday, Thursday and Friday.